My south trip started with a long marshrutka ride. I decided to go all the way south and then slowly work my way back because that seemed like the plan that made the most sense. 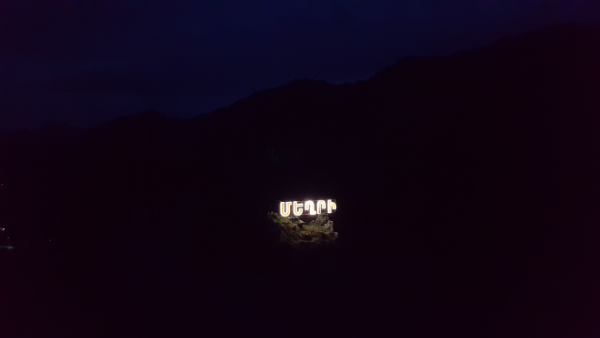 My first stop was Meghri, a town almost right on the border with Iran and the last major town before the border crossing (the border town is still after that, but it’s very small). I wanted to go to see the town and because you can see the mountains of northern Iran from the Armenia side which is the closest I can get. My friend Olivia has a friend in Meghri, Kelsey, and she graciously offered to let me stay with her while I was there! It worked out perfectly because I took the marshrutka there, stayed with her, and when I was planning to move to the next town, she was planning to go to Yerevan, so we took the same marshrutka (but I got off MUCH earlier). I’m getting very ahead of myself, sorry. Let me go back to the beginning. I took a marshrutka from Yerevan to Meghri. It takes around 8 hours and involves a lot of windy roads. The same marshrutka passes through every town that I’m planning to visit on this trip, so it was like I got a little sneak preview of the rest of the week… when I wasn’t sleeping at least. We left at 7:30, I woke up at 5AM because I hadn’t packed (of course), and around 7, I called a taxi to take me to the bus station. I was assigned a seat next to an old woman, and soon after our intended departure time, we were off. This was one of the marshrutkas where you’re supposed to call to make a reservation, so I asked Zoe’s roommate to help me out the day before by calling to save me a seat. Part of the goal of my trip IS to work on my Armenian, but speaking over the phone is HARD! Especially when you’re asking someone to do something for you, and you’re not really sure how to ask them properly. 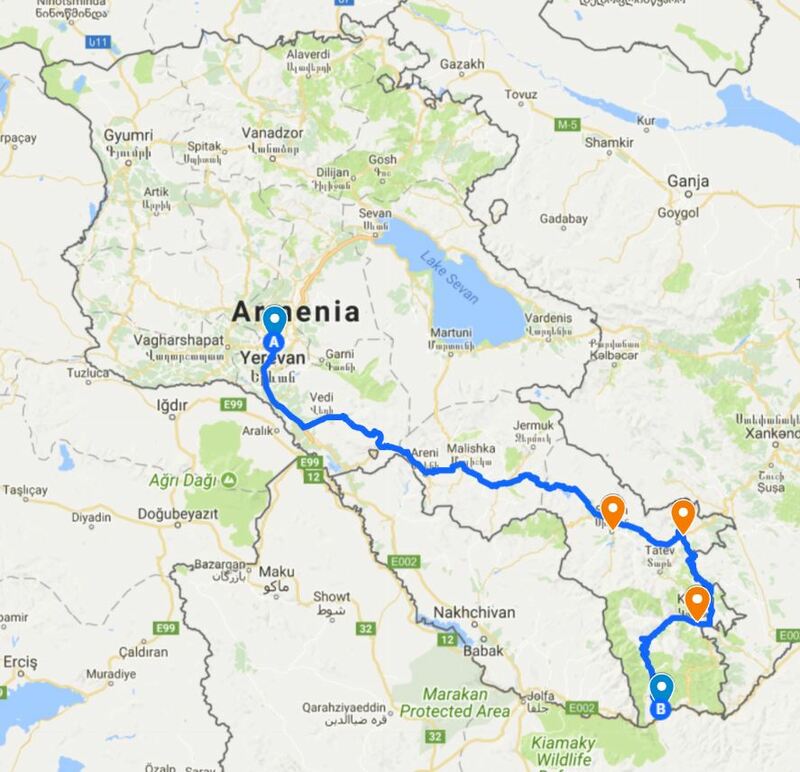 Here’s approximately the route we took to get from Yerevan to Meghri (the blue pin all the way in the south). The other destinations for my trip are the orange pins. 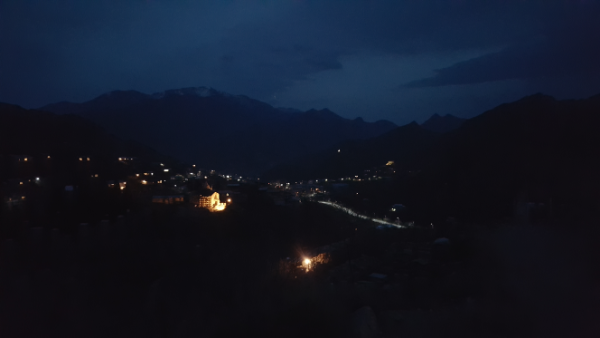 From south to north it’s Kapan, Goris, and Sisian. For the most part, the rest of the ride was filled with me sleeping or just closing my eyes so that I wouldn’t feel like I wanted to throw up. I’m not usually one to get carsick, but whipping around those windy mountain roads in a marshrutka is enough to freak out even my stomach. Plus, it’s a little disconcerting to see the little gravestones lining the roads from cars that almost certainly fell off the side… I’d rather not think too hard about how much I trust the marshrutka drivers. The one benefit of keeping my eyes open was that the view was beautiful. The mountains were just the right amount of snow-covered, and the sky was clear and blue… so I switched between forcing my eyes to stay open and look out the window and closing them so I wouldn’t feel nauseous. You kind of feel a sort of kinship with the other people on the marshrutka on those long trips. I felt like we were all on a grand adventure together. The ride is also very entertaining because people on the marshrutka will drop off bags of stuff with people who are waiting on the side of the road. One woman hailed a taxi in a town along the way and asked it to take a bag of stuff to a village nearby. The coordination that goes into those roadside handoffs is impressive. Also, the marshrutka will stop wherever you want it to, and sometimes, people get off in what seems like the middle of nowhere. After one woman got off, the driver asked her if she was sure because there was literally nothing around. Anyway, it’s all very interesting.